Lisa is a Grand Master Teacher and has worked extensively with each of the chakra areas through healing sessions and teaching others to have a deep understanding of what is happening energetically inside of their body. Chakras are one of the energy systems in the body. Imbalanced chakras can create limitations and blockages emotionally, physically and mentally. In this workshop, she will assist you in bringing about peace and balance throughout every aspect of your life as you learn to heal yourself and others. Chakra chart and session sheets book. Seven sets of chakra balancing stones. 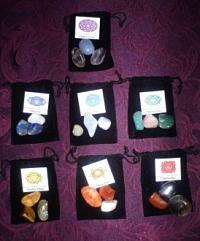 3 stones for each chakra, each set in a beautiful drawstring pouch. Please call 925-497-2529 for workshop dates and times. Classes can be arranged at other convenient dates & times or grouped as a weekend class. Call for details.